Ask any dermatologist (or picky beauty editor) and they’ll tell you that establishing a good skincare routine is the most important thing you can do for your complexion. And while we all know to take our makeup off before we go to sleep and use a night cream, our morning skincare routines are often…lacking. Blame our love of the snooze button, but sometimes it’s all we can do to stumble out of bed, throw on some BB cream and run out the door (grabbing coffee on the way). But no more excuses! We’ve put together the ultimate ten-step morning skincare routine, guaranteed to give you gorgeously glowing skin. Follow this plan for two weeks and we know you’ll see results. You may not want to hear it, but early morning exercise is essential for gorgeous skin; it promotes healthy circulation by increasing blood flow AND reduces stress. Get that heart rate up, and your complexion will have a natural glow for the rest of the day. We love short, intense HIIT workouts like this one from Cassey Ho; it’s the perfect way to break a sweat and give our skin a boost. Instead of pounding coffee first thing in the morning, drink two glasses of water (you’ll probably need them right after your workout). Getting enough water is vital for your overall health, and dehydration especially shows up in your skin with dullness, dryness and breakouts. Making sure you hydrate in the morning sets you up for skin success for the rest of the day, and makes you feel great! Washing your face in the morning is essential to clean away any lingering nighttime bacteria, dirt or makeup residue. We love starting the day with a gentle, oil-based cleanser to get our skin clean without overdrying it. Rinse with lukewarm water; very hot or very cold water is drying for skin. Pat dry with a clean towel used ONLY for your face. If you’re into beauty secrets, here’s a big one: you don’t need an expensive machine to exfoliate your face. A cotton washcloth gives the perfect amount of facial exfoliation, never irritates skin and is gentle enough to use every day. Run the washcloth under lukewarm water and wring it out (so that it’s moist, not dripping), then rub it in small circles on your face, starting from your nose and working out towards your temples, forehead and chin. Not only will this slough off any dead skin cells, the massaging action will also help to get rid of any morning facial swelling. Bye bye forever, puffy face! You heard us: time for more cleanser. You don’t want to leave any post-exfoliation dead skin on your face, do you? Absolutely not. This time, you’re going to use a very gentle cream cleanser massaged in small circles, then rinsed clean with lukewarm water. Pat your face dry with your clean face-towel again, and marvel at how clean your skin is! If you have oily or acne-prone skin, this step is especially important; toner will help balance your skin and stop it from overproducing oils. No matter your skin type, you don’t want to dry out—so make sure you choose an alcohol-free formula. Look for ingredients that are soothing for skin; anything containing chamomile, hibiscus extract and vitamin E is a good bet. To use, apply toner onto a cotton round and swipe gently over your face and neck. Never scrub at your face! People often ask if serums are really important, and the answer is yes. Serums have higher concentrations of active ingredients than moisturizers or cleansers do, so using a good one is the perfect way to get glowing, radiant skin. Whether you’re looking to remedy sun damage, minimize fine lines or wrinkles or even and brighten your skin tone, there’s a specialized formula for you. And a key tip: serum application is just as important as the formula itself. Apply two to three pumps into your palm, rubbing it gently between your hands to warm it and (if applicable) mix it together. Then, press the serum onto your face, starting at your nose and working outward—never, ever rub. This ensures that all those beneficial ingredients really sink in, rather than just being smeared around. Wait three to five minutes for the serum to fully penetrate, then move on to the next step. Never, ever skip sunscreen—even if it’s overcast or if you’ll be inside most of the day. Even a little sun damage today can lead to wrinkles, sunspots, a dull complexion and potential melanoma in the future, so let’s avoid that if we can. Look for a product with an SPF of at least 15; we like anything 30 and above. If you use a traditional cream or spray-on sunscreen, apply it the way you would a serum: spray or squirt some of the product into the palm of your hand, rub your hands together, then gently press the sunscreen onto your face and neck. If you prefer a moisturizer with built-in SPF, even better; gently smooth it over your face (rather than rubbing), and feel pleased that you’ve successfully combined two steps in your ultimate skincare routine. But don’t forget that your face isn’t the only place you should worry about sun damage. Make sure you apply SPF to your chest, the backs of your hands, your legs (if they’re exposed), the tops of your feet (if you’re wearing open shoes) and your scalp, where the hair parts. Prevent burns all over today for gorgeous skin tomorrow! If you used a moisturizer with SPF, you’ve already done this—congratulations! For everyone else, a light moisturizer is essentially for daytime use. Not only does it make your skin look dewy and gorgeous under your makeup, it also keeps it from drying out throughout the day. Apply your moisturizer by smoothing it across your face, neck and chest, taking care to pat it (never rubbing) around the delicate skin of your eyes. The final step! Primer is essential: not only does it fill in pores and hide fine lines, it also provides a smooth base for the rest of your makeup. Some primers even come with built-in skincare, so you can improve your complexion while also making sure your foundation lasts all day. Primers are often silicone-based; if you’re sensitive to this ingredient, you may need to do some homework to ensure your product pick won’t break you out. A small amount of primer goes a long way: think the size of a pea. Using your two index fingers, smooth the primer over your skin (including your eyelids), adding a little extra to areas that are particularly uneven. Allow two to three minutes for it to set, and then voila! You’re ready to apply your makeup, and your skin is ready to face the day. 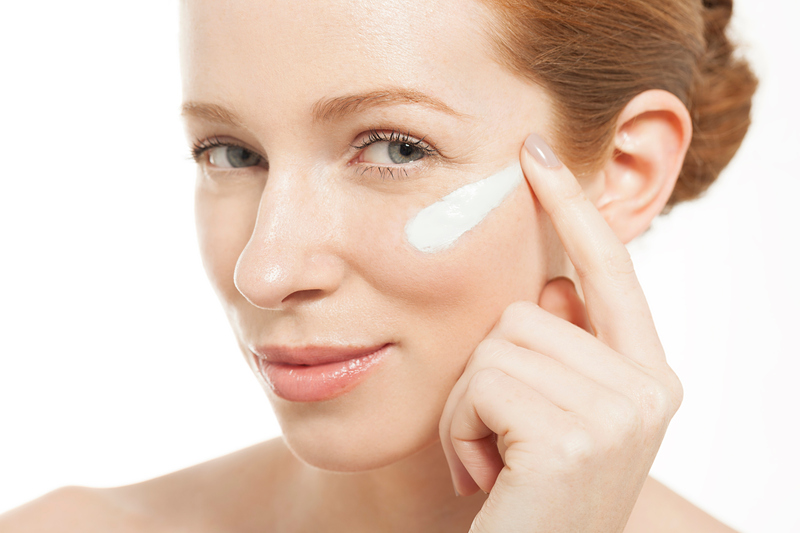 More from Daily Makeover: 6 Things to Know About Retinoids.